No natural snow to speak of in Mammoth so the first week of the new year has seen a lot of riding. If you've been on the fence regarding a trip to Mammoth act soon and pack the OHV's because all the trails are open. But, keep in mind that after reading this update and making plans, the huge snowstorms will probably arrive - and that's the hidden purpose of this report. On January 2, 2012, I told our youngest you want to see the secret trail to Tom's Place? He was intrigued to say the least so we both hopped on his mom's TW200 that was formerly owned by Dave McCoy to do summer mountain bike patrol up on Mammoth. Anyhow, the secret trail to Tom's begins in the Crowley Lake community and skirts private land, then continues over BLM, LADWP, USFS, a CALTRANS easement, SCE easments, and county of MONO roads (dirt and paved). No wonder the USFS once told me that there isn't a dirt route from Tom's to Crowley showing on the newly minted MVUM and CTUC OHV maps that are being handed out for free. That brings a question to mind: If they say that a dirt route doesn't exist, does a motorcycle make any sound while on it? The pavement ended quickly at the Crowley Lake ball field and we found ourselves climbing a rather steep jeep trail up to a mesa overlooking Crowley Lake and the Glass Mountains. Soon we arrived at a sign showing bikes, quads, and horses ok, but no jeeps. And then the trail livened up with large rock pinch points, and fun dirt berms winding down the canyon to the 395. After another climb up we descended down into a meadow complete with a coyote running about and bridge crossing over Crooked Creek with small fish looking up at us through a frozen surface. Passing an old shack and outhouse we racked up some more miles along some fast two-track on our way to a huge pipeline that dives deep underneath the U.S. 395. One can imagine the treat this was for our son! After a short tour of the Sunnyslopes neighborhood trail network we went back underground and took a snack break at the Tom's Place general store. The ride back looped on different (non-existent, supposedly) dirt trails and lot's more pavement. Temps were in the high 50's, and the entire loop was about 16 miles. It could be shortened a lot without the excursion into the Sunnyslopes community. 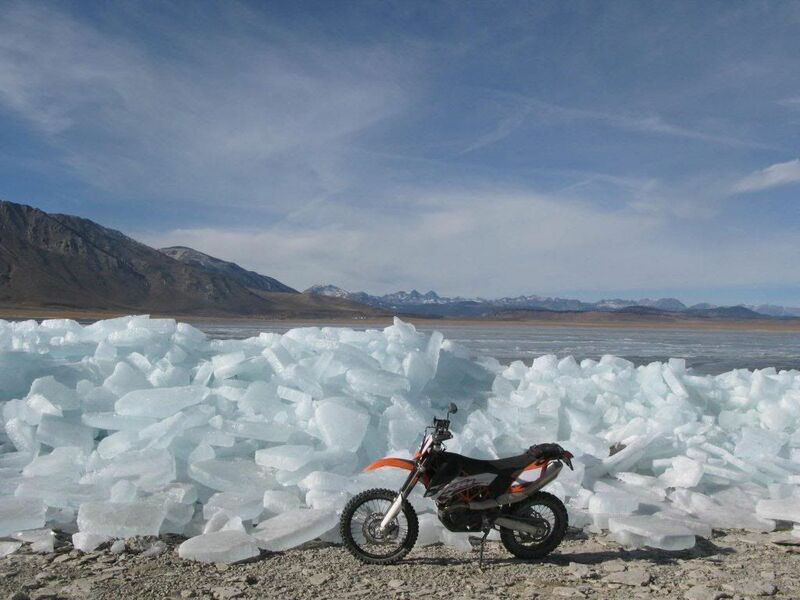 Ice flows on the shore of Crowley Lake submitted from MammothMC member Jeff.